A review of Mineral Fusion SPF 16 Eye Brightening Eye Cream. Post may contain affiliate links. When I was 28 years old, I developed a sensitivity to the sun. It meant staying out of the sun in the middle of the day, no more laying out with baby oil slathered over my body, and sunscreen worn all the time. It was probably the best thing that ever happened to me. My dermatologist thinks that my skin looks great for my age and it’s probably all thanks to that diagnosis. I wear sunscreen every day, unless I absolutely know for sure that I will not be going outside. 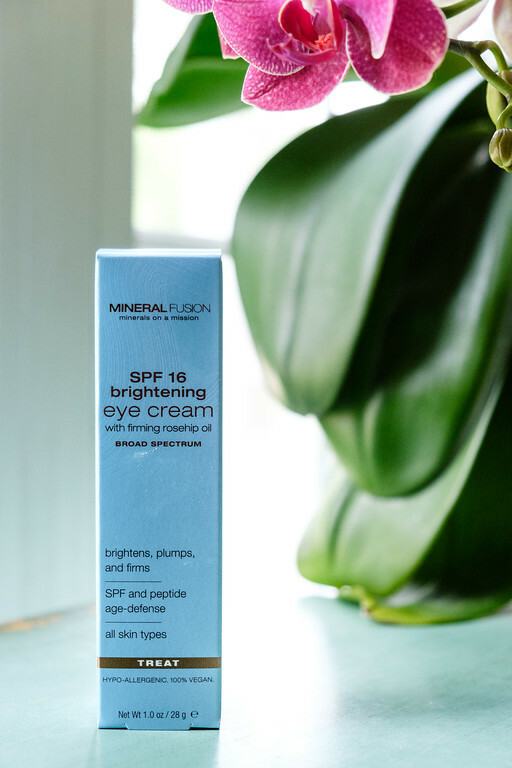 So, I was thrilled to see an eye cream from my favorite company that sun protection – Mineral Fusion SPF 16 Brightening Eye Cream. I have been using this eye cream for about a week now and I love it. It goes on kind of white like most zinc oxide sunscreens, but then goes invisible. It feels moisturizing and with coconut oil and shea butter, I know that it is. According to the package it has Vitamin C to restore tone and light reflecting Mica to subtly illuminate the eye. Rosehip oil and avocado butter for hydration. It has broad spectrum mineral SPF protection. Many of the reviews on Amazon complain that it is very thick. They must have changed their formula, because mine was not thick at all. It was creamy and went on very light. It did not sting my eyes in any way and it didn’t cause my eye make up to smudge. It is fragrance free, gluten free, paraben free, phthalate free and free of artificial colors. It is hypo-allergenic and 100% vegan. I like having a day eye cream that not only moisturizes, but also includes sun protection.